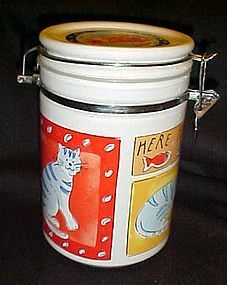 Nice heavy stoneware round cookie jar for kitty. Feed Me Cat by Riviera Van Beers for Signature Houswares Inc. Assorted hand painted colorful cat decorations on sides and the top. Chrome bail clamp lid, and silicone gasket to keep kittys treats fresh as can be. 7 3/4" tall. Like new condition, and very heavy.